Fr. 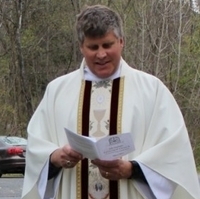 Scott trained for ministry at Fuller Theological Seminary and Nashotah House Episcopal Seminary and was ordained a Priest on January 9, 2010. He served as a Curate at Christ Church In Ballston Spa from January 2010 through December 2013 with a focus on evangelism and healing ministry, becoming Priest In Charge of All Saints Round Lake in January 2014. Scott holds a Ph. D. in Electrical Engineering from RPI and is married to Stephanie - they have four beautiful children.